I’m from Boston, so it’s been a tough few days. It was evening here in Ireland when the bombs went off at the marathon, and I was glued to the news following what was happening and frantically checking in with my friends and family back home until past midnight. Luckily, all of my loved ones are safe, but there was more than one near miss. One friend had been by the finish line but had left early to go work. Two friends from college were between the explosions and ran for their lives, escaping unscathed. From Facebook updates I learned that another former classmate was just yards from the second explosion, and another was on the scene as an EMT all afternoon. My mom and stepdad always go watch the marathon, but for no particular reason they decided to stay home this year. My dad was out of town. And so on. Something that Ireland really, really beats the US on is that it feels so much safer to me. To put it simply, there are no guns here. In the States, there’s always a lingering feeling of unease whenever I’m in a public place. Is some stranger going to just start shooting? (This has been happening in the US with disturbing regularity this past decade.) Is that shouting match going to escalate into deadly violence? Is a bomb going to go off? And now it’s happened in my hometown, and I'm devastated. How are we supposed to feel safe? I’m probably a more nervous person than most, but I think a lot of us who’ve grown into adulthood in a post-9/11 America have these worries. And I just don’t have those fears here. The worst thing that’s likely to happen to me is that someone could come up to me and grab my mobile phone. I’m so much more at ease on public transportation, in theaters, in restaurants, in shopping malls, even just walking down the street here. It’s a feeling I take note of all the time, and I’m thankful for it. 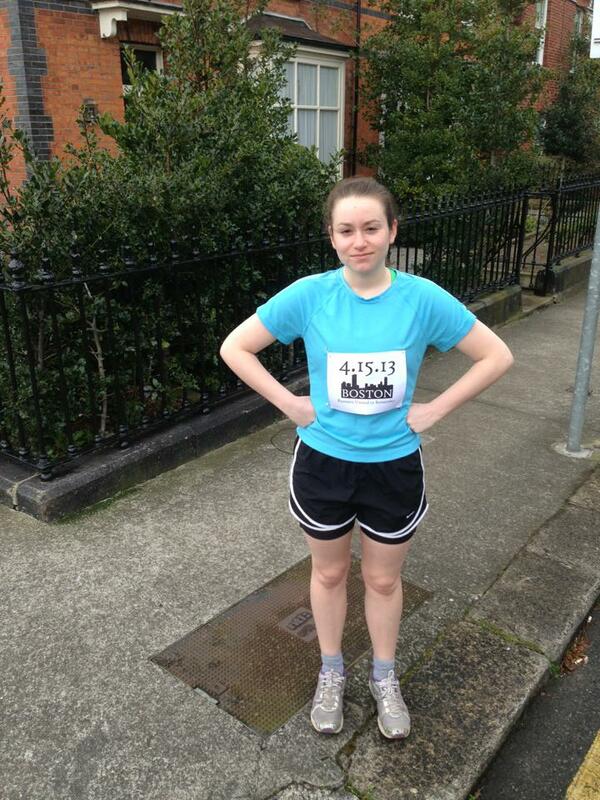 So if you saw a girl wearing a racing bib pinned to her shirt running solo this morning in Dublin, that was me. I pushed myself pretty hard (I had to take a nap this evening! ), but that was easy to do thinking of everyone who trained for months and months but didn’t get to finish, and now have a day of fear and tragedy rather than celebration and triumph to look back on. It felt good – but it still feels terrible. Sending lots of love home.